Bangkok Best Home - Real Estate Property Sales and Rentals Management. For Sale / For Rent, Long-Term Rentals / Short-Term Rentals, Apartment, Condominium, House, Townhouse, etc. Min Price/wk. ฿ 1,000 ฿ 2,500 ฿ 5,000 ฿ 7,500 ฿ 10,000 ฿ 15,000 ฿ 20,000 ฿ 25,000 ฿ 30,000 ฿ 1,000 ฿ 2,500 ฿ 5,000 ฿ 7,500 ฿ 10,000 ฿ 15,000 ฿ 20,000 ฿ 25,000 ฿ 30,000 Max Price/wk. Min Price/mo. ฿ 10,000 ฿ 15,000 ฿ 20,000 ฿ 25,000 ฿ 30,000 ฿ 40,000 ฿ 50,000 ฿ 60,000 ฿ 70,000 ฿ 10,000 ฿ 15,000 ฿ 20,000 ฿ 25,000 ฿ 30,000 ฿ 40,000 ฿ 50,000 ฿ 60,000 ฿ 70,000 Max Price/mo. (REQUIRED) Click on the " " checkbox to select the station to search for properties in the vicinity. (REQUIRED) Click to select you are looking to "Buy" or "Rent" a property. (OPTIONAL) Select additional property criteria and click the "Search" button. Apartment/Condominium For Rent Best Deal! Copyright © 2011 Bangkok Best Home Co., Ltd. - bangkokbesthome.com All Rights Reserved. 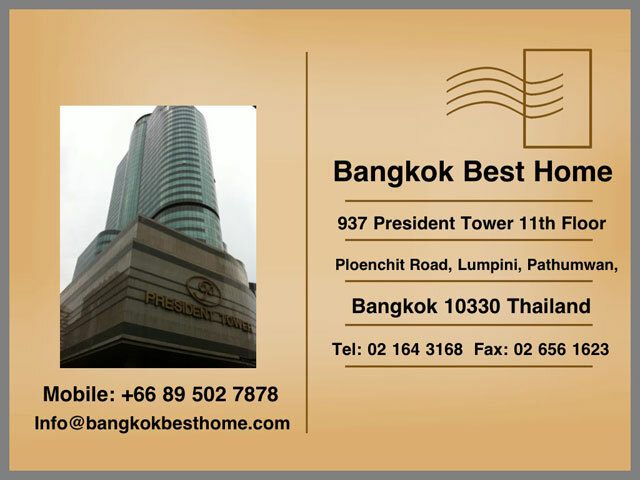 Bangkok Best Home Co., Ltd.
69/5-6, Soi Sathorn 10, Sathorn Road, Silom, Bangrak, Bangkok 10500, Thailand.